No one would argue that among two of America’s most beloved institutions are the late Fred Rogers (1928–2003) and libraries (1849--∞). Furthermore, what I realized when I watched Won’t You Be My Neighbor? Morgan Neville’s lovely documentary last night was that the reasons the two are such icons in American culture are not at all different. Kindness, curiosity, acceptance, learning, and understanding are all elements found both in Mr. Roger’s Neighborhood and the best libraries. Not to mention that both places have someone who gives young people the attention and respect they so deserve. Curiosity is one of my favorite words, both because I like how it sounds and because I revel in it’s meaning. Every episode of Mr. Roger’s Neighborhood was a trove of wonder — viewers journeyed to places real and imagined. Mr. Rogers visited grocery stores, train stations, farms, and even the library. Indeed, in episode 1637, he goes to the library and requests videotapes about how people make sweaters and sneakers! Isn’t it a marvelous thing to be able to ask questions and get answers? Fred Rogers encouraged questions from children and considered them seriously — he also helped them seek out answers. Libraries consider questions from everyone seriously; the beauty of the reference desk is that you can ask anything and the librarian will do her best to help you. Devoting attention to others takes time, and this was one of my favorite sections in Won’t You Be My Neighbor?, where it contrasted the way Mr. Rogers used time on his show with the prevailing trends on television. 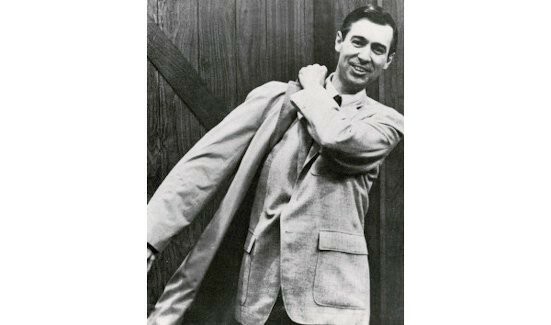 Whereas every other kid’s show moved fast fast fast, Mr. Roger’s Neighborhood was unhurried. In every episode, Mr. Rogers took the time to hang up his jacket and change his shoes, he fed the fish, and most importantly, he took the time to listen. In an article called “Slow Info: Where Libraries, Reading, and Well-Being Converge,” I wrote that both libraries and nature are associated with slow information because “Both encourage reflection and peace, contain plenty of the beautiful (and the sublime)…” Appending Mr. Roger’s Neighborhood to that list makes sense. The show, libraries, and nature are all facilitators of slowly and deliberately comprehending the world around you, whether it’s exploring the library’s carpentry books, stopping to stare at a colorful insect, or taking a moment to understand one’s feelings. In a society that shrieks “next!”, libraries envelope you in time to think. While time is one of the kindnesses both libraries and Mr. Roger’s give, perhaps more vital is acceptance. This hasn’t always been the case for libraries; in their history, there has been plenty of prejudice, censorship, and plain cruelty, and some would say there still is, but today’s libraries do their best to be welcoming to all. More and more libraries are learning how best to serve their homeless patrons, stock their shelves with diverse books, and remove barriers to library use that disproportionately affect the poor. Through proactive programs like all-abilities storytime, Lunch at the Library, Human Library events, and many others, libraries are becoming ever more like Mr. Roger’s Neighborhood when it comes to making people feel that they’re glad just the way you are. Something that is as important today as it was during the decades-long run of that beautiful television program. If you support what libraries give to the world, like EveryLibrary on Facebook!